Apartment in Tywyn, near Aberdovey, Gwynedd, Snowdonia, Wales - Panoramic sea views, easy access to beach and town, magnificent sunsets, dolphin sightings possible. Trem Enlli is a first floor seafront apartment with balcony forming part of a Victorian terrace in the popular seaside resort of Tywyn on the edge of the Snowdonia National Park. It looks over the beach and promenade and offers panoramic sea views with easy access to both beach and town, perfect for a relaxing holiday or activity break. The spacious apartment offers one double bedroom with access to the balcony and a large living room with a sofabed. The sunny bay window faces west over Cardigan Bay, perfect for watching the ever-changing sea and skies and for dolphin spotting when the conditions are right. There is a modern fully equipped kitchen area and separate bathroom, with night storage heating and double glazing throughout. Electricity included. Wifi. There is off road parking for one car or free parking in the car park opposite. No smoking or pets please. Trem Enlli is definitely a lovely apartment in a wonderful location. We loved the sea views and the easy access to beach, town and many places of interest. Bathroom with washbasin, W.C. and bath with shower over. Electric radiators - all heating included. Double bed made up for your arrival. Extra bedding provided for sofa bed on request. Parking available on site behind apartment block or in free car park opposite on sea front. Hand and tea towels provided. Please bring your own bath towels or they can be provided at an extra cost of £10 per person. Beach towels not provided. The large sunny living/dining room has a double sofabed and 2 armchairs with a further table and chairs in the west facing bay window overlooking the sea. There is a TV/DVD and CD/radio. Balcony has outside chairs and small table. The modern fully equipped kitchen area has a cooker, fridge with freezer compartment, toaster, microwave and a breakfast bar with stools. 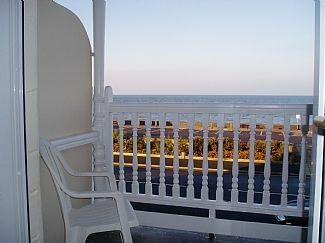 Balcony overlooking the sea - table and chairs provided. Outside: Balcony has outdoor furniture and offers a perfect place to watch the world go by. Cleaning / Towels / Linen / Maid service: Linen is included with beds made up for arrival. Hand towels and tea towels provided but please bring your own bath towels. Extra bedding is provided for the sofabed if required. Property cleaned and linen changed between lets. Entering the property for the first time ,it was quite dark, found light switch got used to it. The apartment itself was lovely, great location fantastic view, comfortable and warm. Everything we needed in the kitchen. The bathroom nice and modern. During our stay Storm Freya arrived the views of the wild and windy sea were spectacular. The property was ideal for our stay, right on the beach and surrounded by beautiful countryside. Snowdon is about an hour and a half away but it’s a lovely drive. Tywyn has everything you need on your doorstep and the tallylyn railway is a must. The property is ideal for a couple / small family with good equipment and friendly owners who pay good attention to the needs of their visitors. great location, facilities all as advertised. we stayed for 3 nights, wished we had stayed longer. great location on the seafront. property as advertised (private parking, wi-fi that worked, etc). Trem Enlli apartment overlooks the seafront promenade and sandy beach in the popular seaside resort of Tywyn and offers a variety of watersports including surfing and fishing. Nearby Aberdovey, 4 miles away, is a well known windsurfing and sailing centre.The beach and all its pleasures are simply a few metres away. Tywyn has a mainline British Rail station with connections from Birmingham among others and is ideal for those preferring not to come by car. The beautiful coastline can be explored by train, north to Barmouth, Harlech with its famous castle, and the Italianate village of Portmeirion and south to Machynlleth, home to the Centre for Alternative Technology and on to Aberysytwyth and beyond. There is also a comprehensive bus service in the area. Tywyn is a 10 minute walk, 3 minute drive. Aberdovey is a 10 minute drive. Machynlleth is a 20 minute drive. Tywyn is a popular seaside resort with a seafront promenade and sandy beach, ideal for swimming, sunbathing, watersports and fishing. If offers a wide variety of shops including supermarkets, cafes, pubs and restaurants, a leisure centre with indoor swimming pool and comprehensive sports facilities and a cinema showing a varied programme of films. There is also a health centre, hospital, library, post office and several churches. Along the promenade there are hard and grass tennis courts, putting green, crazy golf, crown green bowls and a large children's play area with tearoom. The promenade is a perfect place to potter along, taking in the spectacular sea views or just watching the world go by. The area boasts breathtaking mountain ranges and beautiful valleys, crystal clear lakes and cascading waterfalls and offers something for everyone. There are endless opportunities for walking, across the sands to Aberdovey or along the Mawddach Trail along one of the UK's most spectacular estuaries, or up Cader Idris from where Ireland can be seen on a clear day. Alternatively there are designated cycle routes for the cycling enthusiast, into the natural beauty of the Snowdonia National Park or along the glorious coast road to Fairbourne and beyond. The famous Talyllyn steam railway begins its journey here taking passengers on a scenic journey up the valley to the stunning Dolgoch Falls or on to the slate mining village of Abergynolwyn. Nearby Cregennan Lakes offers stunning views of the Mawddach estuary and Bird Rock, while Machynlleth is home to the Centre for Alternative Technology. Both are close by while several castles, gardens, museums and family parks are all within comfortable driving distance. Tywyn is definitely a unique and exciting holiday destination. Booking Notes: A non refundable deposit of 20% is requested to secure the booking with the balance payable no later than 6 weeks before arrival unless otherwise agreed. If payment is not made accordingly, the reservation is subject to cancellation at any time. The person placing the booking is asked to consider insurance to cover the possibility of cancellation. Changeover Day: Changeover day is Friday although this is flexible out of season, November to March inclusive. Arrival time is 4pm, departure time is 10am unless otherwise agreed.